When you run a half or full marathon, they hand you a medal at the end. Sometimes they even hand out medals for 10K, 20K and 10-mile races. I think that was one of the things that I liked about distance races when I first started running. There was nothing else in life that I could do where they would give me a medal at the end. I worked a lot harder and longer at jobs but nobody ever gave me a medal. 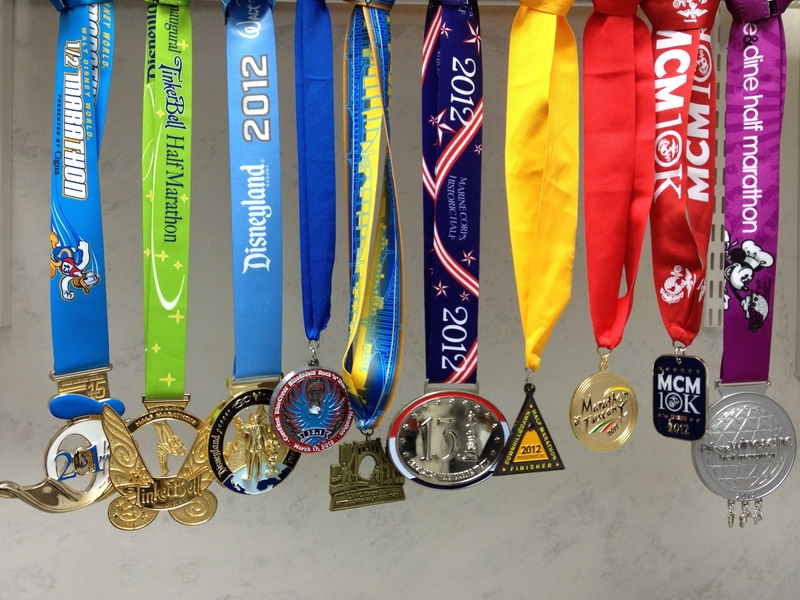 If you run as many races as I do, you end up with a lot a medals. A friend gave me a wall-mounted holder for my medals but I quickly filled that up. I had so many that sometimes I worried that they would pull the hooks out of the wall. Collectively, these things weigh several pounds. Lately I have been feeling overwhelmed by all the stuff I have. I decided that it was time to start lightening the load around my house and get rid of things. You may have heard about Marie Kondo, the Japanese cleaning consultant, who developed a process for simplifying, organizing, and storing your belongings called the KonMari Method. The process finds its roots in the Buddhist belief that we all have much more than we need. We can live more happily when we let go of material possessions. I agree with that thinking. A few months ago I mentioned a similar thing – if you want to be happy, buy experiences, not stuff. Here is an example of how the KonMari process works. Let’s say you want to get your closet organized. You take all the contents out of your closet and put them on the floor. You have to touch each individual item and ask yourself whether it brings you happiness. You only keep those things that make you happy. Marie also says you need to express your gratitude to your possessions by thanking them. You should thank a wool sweater for keeping you warm in the cold weather. All the things that don’t make you happy are tossed or donated to a charity. When you are done, your closet is Kondo’d (yes, people are now using her last name as a verb). I decided that I would Kondo my race medals. I took all my medals out and held each one. I thought about the race where I earned the medal – maybe the weather was bad, or something funny happened along the course. I quietly thought how much I appreciated what the medal represented – hard work and long hours of training. Then I made a pile of medals that I would keep. There certainly were races that were very special and I could not imagine parting with the medals from those. I was pretty tough. There weren’t too many medals in the keep pile. The pile of medals that would be moving on was much bigger. “The day after he finished the 2003 Chicago Marathon, Steven Isenberg, M.D., a head and neck surgeon in Indianapolis, paid a visit to a colleague who was hospitalized. The two men were a study in contrasts. Dr. Isenberg, 53, was on a postrace high. Les Taylor, who had prostate cancer, lay flat on his back with tubes running in and out of him. M4M replaces the ribbon on the medal with a Medals4Mettle-branded ribbon before presenting it to the recipient. Since a lot of the medals are given to children, M4M doesn’t accept medals that have beer bottle openers, beer logos, or other designs that might not be appropriate for children. They will also deliver a medal to someone that you designate. I always knew that when it came time to part with my medals, M4M would get them. One of my friends told me about a young man in his early teens who was battling bone cancer that had spread to his lungs. At his age, I can only imagine how difficult it would be to be stuck in a hospital getting poked with needles all the time. It was a no-brainer. I set aside the first marathon medal I ever earned for him. I found the M4M chapter nearest to where he lived and arranged for them to deliver the medal while he was going through a round of chemo. He needed it more than I did. After they delivered the medal to this young man, I continued to exchange emails with the chapter leader. The chapter was near a children’s hospital and was just getting started. They needed more medals. They were the perfect people to give all my Disney-related medals. I can’t say it was easy to part with my Inaugural Tinkerbell medal (it had a spinning Tinkerbell in the middle and I got a PR at that race!) but I could only imagine the joy that would give a little girl in a hospital. I sent over 5 pounds of medals to them. To help cover the cost of putting new ribbons on the medals, I sent a monetary donation too. I don’t miss my medals. They were just lots of stuff and not anything I spent much time looking at anyway. I still have the memories – good and bad – from every one of those races. The medals are off doing something good for someone else. Now that I have Kondo’d my medals, I am looking at the race shirts spilling out of my dresser drawers. I think I know what my next Kondo project will be. Would you like to donate medals or make a monetary donation to Medals4Mettle? Check out their website Medals4Mettle.org for more information. They have over 70 chapters in the US and six overseas. Angie’s List magazine published a terrific article about M4M in March 2015. Here is a link to it. Want to learn how to Kondo? Pick up Marie Kondo’s best selling book “The Life-Changing Magic of Tidying Up – The Japanese Art of Decluttering and Organizing”. Visit her web site Tidying Up where you can read an excerpt from her book.